Autumn is an exceptional educator and the quilts she brings are top notch. Sandy, Laura, Michelle, and I have been playing with the shop's demo set up of the cutters. Michelle and Sandy made a quilt the first morning! The block construction is smooth. I'm looking forward to using it to make up my Embroidery Club kits! 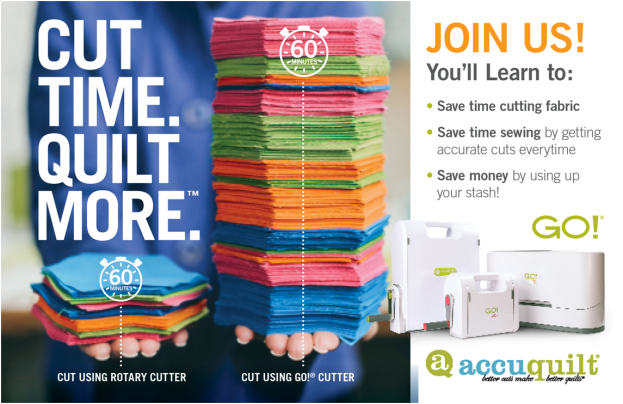 Join Autumn Pengelly, AccuQuilt Educator, as you’ll learn tips and techniques to get the most use out of your fabric using the AccuQuilt GO!® Fabric Cutters. Call the shop or register in-store to reserve your spot today! $10 discount upon arrival for GO! product.